Fun, Comfortable, Friendly...See the sights of Los Angeles, Hollywood and Beverly Hills in air-conditioned comfort in a Mercedes with an experienced tour guide. See the sights you can't see in a hop-on hop-off bus or regular tour bus (Hollywood Hills, Rodeo Drive). 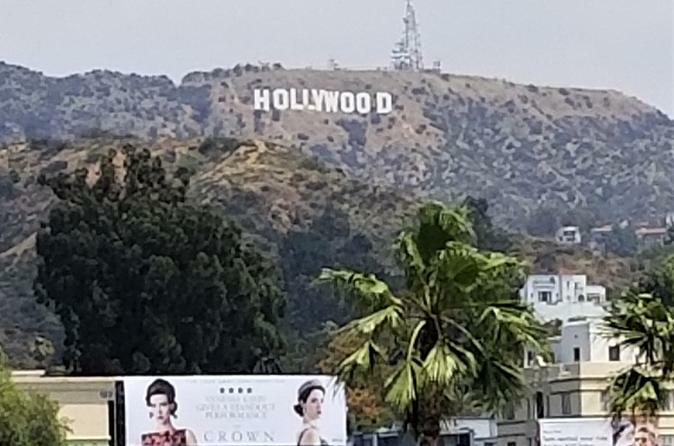 You'll see downtown Los Angeles sites, Hollywood Boulevard Walk of Fame, the Hollywood Sign overlook, Sunset Boulevard, celebrity homes in the Hollywood Hills, Rodeo Drive, and stop for lunch at the famous Farmer's Market/The Grove. Tours are conducted in air-conditioned Mercedes vans and narrated by a professional and experienced live English-speaking guide. At all stops you are free to explore with your group. Hotel pick up/drop off is available from North Hollywood, Hollywood, Los Angeles for no extra fee. Hotel pick up/drop off is available from LAX area, Santa Monica area, Anaheim area and San Gabriel valley for an additional $10 fee (payable upon pick up.) Uber or Lyft may be used in some instances. Tours depart from 615 North Main St / Los Angeles, CA 90012 at 10:00 am and noon. 2:00 tour arranged by special request.